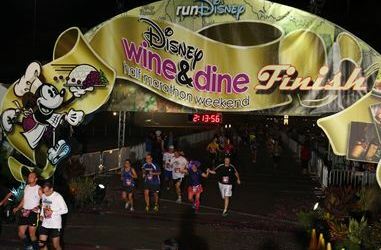 Making it to the start line of the 2012 Disney Wine and Dine Half Marathon was certainly an event that was a long time coming! Yes, it was more than a year ago when hubby agreed to run the relay with me – y’know, back when we thought that was option – but then things changed…we learned that race dates were changing to accommodate a new race (Tower of Terror 10 Miler) and in a whirlwind change of events, BOTH hubby and I were registered to run the 13.1 distance race! So…fast forward to Saturday, November 10! Although hubs hadn’t formally committed to a training plan (despite my efforts) he did manage to stick to a pretty regular running schedule and topped out at a 9-mile run. He had been through several pairs/styles of running shoes before deciding the Saucony Kinvara were his ‘sole-mates’ and he was ready to rock those 13.1! 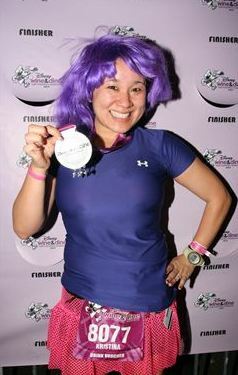 I ended up not wearing arm warmers (it was in the 60s) and of course, adding the signature crazy purple wig! Under the skirt, I wore my favorite lululemon shorty shorts (I had just scored a second pair at the outlet that weekend). A few people recognized the costume, but most people just said, “nice hair!” Haha, that works, too!! So anywho, back to the race! We had boarded the 7:30ish bus over to the Wide World of Sports Complex. Hubs was apprehensive about going that early, but I told him that it was better than worrying about not getting there, on account of traffic, etc. Truth! It took us probably 35 minutes to get dropped off at the pre-race area. After our photo, we wandered around the runner’s village area for a while and hubs grumbled a bit about being there so early…still, we made the most of it, walking around and seeing some friends around! About an hour and a half before the race, hubs needed a restroom break so we headed over for that before it was time to head into the corrals. Once there, it was still about an hour til race start (hubs was not a fan of waiting) but runDisney kept it interesting with a DJ. 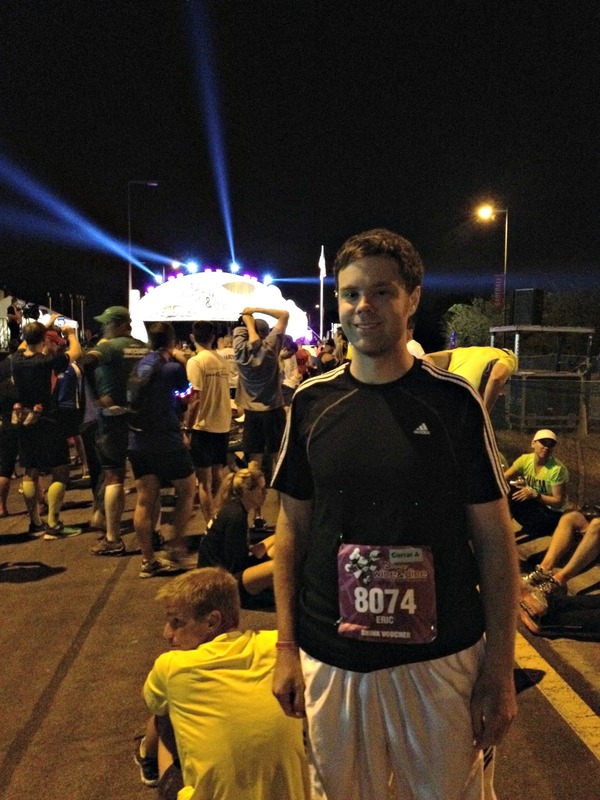 We took a few pictures in the corrals before it was time to move up – and fireworks started the race! We were off! Hubby’s first half marathon – and my first pacing experience – were all systems GO! The first few miles were kind of dark, but after a mile, it was not nearly as congested as I imagined it would be, given the size of the field (14K, I want to say). There was entertainment down Osceola parkway including a live band, speakers with energetic music, puppeteers and more! In fact, when we hit Disney’s Animal Kingdom parking lot, there was Main Street Electrical Parade Music blasting and a lit up parade float zooming around the area. LOVED that! 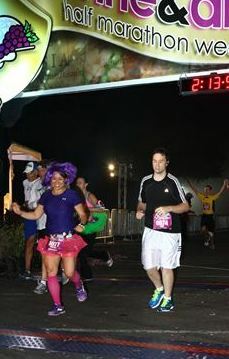 By this time, hubs and I had settled into a rhythm of running either side by side, or me leading by a few strides. At water stations, I’d zoom to the end (water, as Powerade was at the front) and walk a few steps with the cup and wait for hubs to run by. The major advantage of running these runDisney events with lots of park knowledge is this: you know where all the bathrooms are! Each time we neared one, I called out to hubs to ask if he needed to stop (which, on another tangent, is another distinct advantage of runDisney events – real bathrooms). Right before Expedition Everest, hubs took up the offer and ducked in for a restroom stop…then, we were off! Around this point I think was when we saw the light up piano and Chip and Dale! Had to stop for them! Luckily there was no line so I posed for the pic and jumped back into pace. Around this point, I was getting incredibly jazzed about heading into Disney’s Hollywood Studios! It had been a long time since I had last seen the Osborne Spectacle of Dancing Lights and I was really looking forward to it! 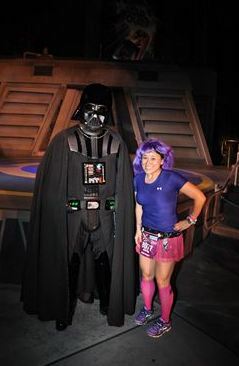 How could I miss a photo opp with Darth Vader? Plus, running through DHS just felt really magical in general with all the lights (that park is so pretty at night). It was kind of neat to loop around the park through on and off-stage areas – even passing by Walt’s plane and through the Backlot tour tunnel! At this point, I was literally floating. I was having an incredible amount of fun! I was cheering, jumping, high-fiving and pumping up the spectators like a crazy person. I kept checking on hubs and although he looked tired, he was chugging right along! I told him that he knew where we were, we just needed to get to and through Epcot and the race would be over! I thought that would reassure him, though it honestly made me kind of sad to think the race was almost ending! Somewhere between DHS and Epcot. When we arrived in Epcot, I was almost crying with happiness (hubs was probably crying too…in agony, but again, he was still rocking it). We turned the last corners through Future World and out the Main Entrance area I used to walk through as a GR CM…. See Spaceship Earth and the Monorail ramp? Hubs was ready to let go of my hand pretty quickly though…haha. OFFICIAL FINISH: 2:13:39 (Hubs) and 2:13:40 (me) – roughly a 10 min-ish pace! 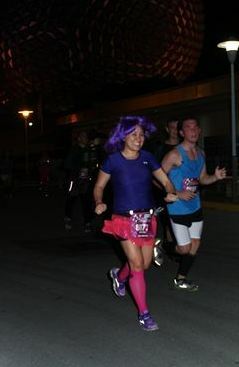 Still wearing the wig after 13.1 miles! We then headed out to park entrance to change shirts and then head into the after party…after all, we earned it! I was so proud of hubs for finishing the race and I can honestly say that this was the most fun I have ever had DURING a race. As I gain more experience as a runner, I have gained a greater appreciation for all aspects of the sport: and whether running competitively (against my own PRs) or for the joy of running – it’s just a happiness I cannot put into words! Although we definitely ran positive splits – and I definitely added some extra distance to the Garmin darting around running up and back, I realized that it could be really fun to learn how to pace someone! I am going to work on feeling out different paces so I can continue this for others, possibly!! Sadly, we had to leave back to VA within hours of finishing the race, but I wasn’t going to get too down about it – after all, in less than two months, I’ll be off on another incredible week of magical running experiences with the Walt Disney World Marathon and Tinkerbell half! Yayyy 2013 Coast to Coast! What’s been your most memorable racing experience? REAL BATHROOMS!! I ❤ Disney!! Great job! Thanks so much! It was a blast…and yes…REAL BATHROOMS! Rejoice!! Love your costume Krissy! 🙂 Looks like a fun race! 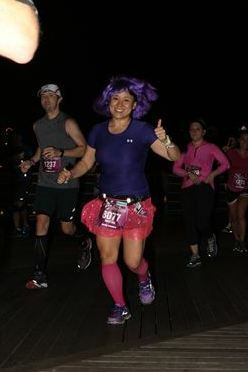 I gotta ask this question–is a night race like this one easier or more difficult? I would think one advantage would be that you have the whole day to “rest up”, but would love to hear if you prefer night vs. early morning, and how they help or hinder you throughout the race! For me, it was kind of harder to “wait around” all day because I am a morning person/ morning runner. Thankfully, since I did the 5K that morning, I was able to get that fix in. 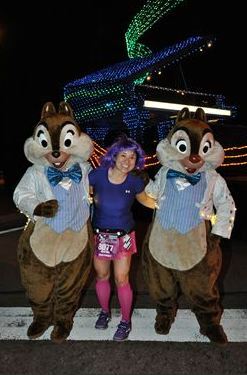 I also had 20 miles to do that day on my marathon training plan, so after the 5K, I did 4 miles around SSR/DTD and then relaxed before the race (and by relaxed, that meant played around DTD, lol). I’ve been really wanting to do a Disney race for awhile and your photos just convinced me even more! Nice job; glad you both had fun! Thanks! Hope you can get down to do one soon! 😀 I’ll be doing two in January and cannot wait!!!!! Awesome job on the race! LOVE your recap! :0) Sorry y’all had to leave so soon! Loved reading about your race…. just bummed I didn’t get a chance to meet you while we were so so close! 🙂 Congrats on a FUN RUN! Thanks, Jess! And yes, BUMMER! Esp after I saw your finish time, we may have even run near each other at some point!!!! Did you have fun???? Hahha thanks, Kat! 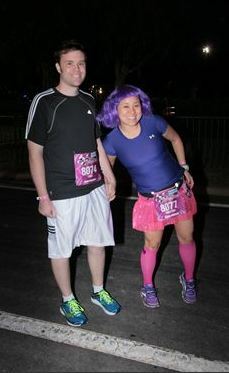 Will you be around at WDW Marathon Weekend?? – Thanks for your kind words on my blga;#8230&con’t tell you how much that means coming from someone whose work I admire so much…I don’t know if I enjoyed the photos more or the paragraph about “almost sisters.” Sigh. I miss her. Thanks, Tasha! It was a great experience!!! Thanks, Megan!!! I wish i had seen ya too!!!! How fun!! This race is definitely on my bucket list! Awesome race! 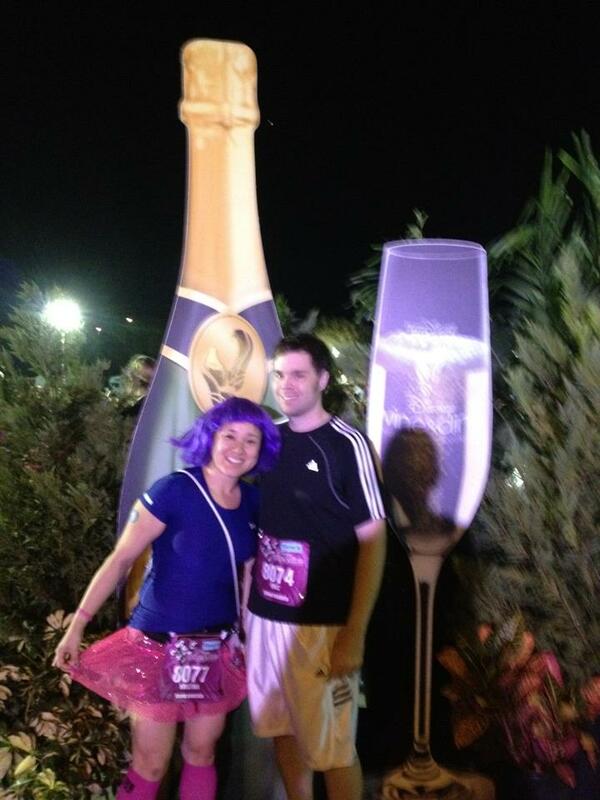 How fun that you and the hubby got to run together. Your photos look like you are having so much fun! I LOVE THIS RECAP SO MUCH!!! You look like you’re having SO much fun, and how cool that your H got to run with you!!! 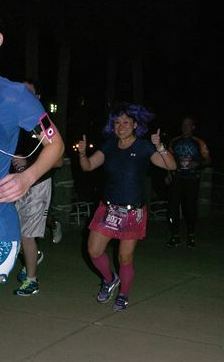 Real bathrooms – runDisney is the best! Thanks, Carly! I was beaming with pride about his finish!! I vote we do some kind of girls trip to do this next year!! 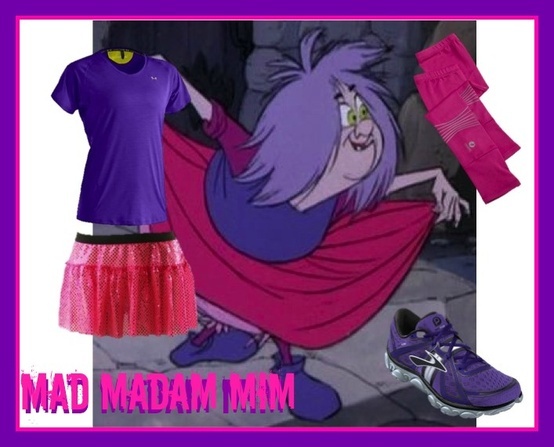 I am dying to run a disney race! Way to go, K and E!!! Thanks Lizzie! Need to get you down there for a Disney race soon!!! Yay!! Loved your costume and that your wig stayed on the entire time!! Sounds like it was such a fun race!! Congrats to you and your husband! So sweet that you both ran together the whole time! In sync! Nice job with the costume! Thanks, Madison! 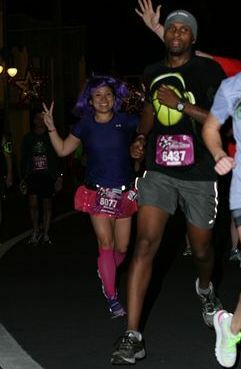 I don’t know if I can ever run a Disney race without a costume now, it is too fun!! Real bathrooms – I can’t believe I ducked into one after searching forever for a port-o-potty! I’m glad you both had such a fun race – you were obviously enjoying yourself and you both did great. Good luck on that Coast to Coast challenge in a few months! I’m sure you are going to rock it! Just a bit of fun facts. Most measured courses will run a little longer then stated when they are a certified course. Something like 1 to 3 % not sure exactly. This guaranteeing that the course was at least as long as stated. I could look it up for you but I realized you probably are not that interested. I love your costume! Such a great idea! I hope people realized who you were! Awesome recap, and congrats to the hubby! So glad i finally got to meet you that weekend! Thanks, Jenn – and likewise! I was glad to meet IRL!! 😀 Hope to see you again real soon!! Great recap! Loved the pictures: you looked incredibly happy in every one!